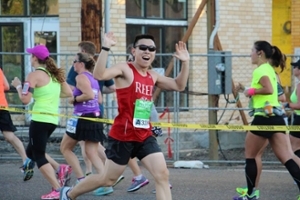 Many other Reed runners tackled the full 26.2 miles, including John Cushing ’67, Terry Hill ’74, John Bergholz ’83, Jim Hutcheon ’90, Melanie Casprowiak ’95, Susie Baunsgard ’96, Clara Siegel ’09, Yasin Karim ’10, Ianthe Mugglestone ’11, Heidi Whitehouse ’13, Malkolm Graffe ’13, physics major Ross Petersen ’15, psych major Austin Pitschka ’16, biochem major Eren Veziroglu ’16, Prof. Rao Potluri [math], Prof. Johnny Powell [physics], campus events czar Todd Pangilinan, and alumni-community organizer Todd Hesse, who ran for a full five hours proudly bearing a gargantuan Griffin standard. In the Half Marathon, physics major Jack Flowers ’15 came in third, crossing the finish line at an estimated 1:16:35 (but was disqualified by fussy officials—some technicality about his bib). 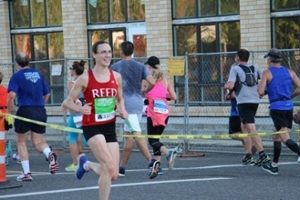 Prof. Kyle Ormsby [math 2014–] crossed the line moments later at 1:16:52, while Prof. Alison Crocker [physics 2014–] posted a scorching 1:23:10, coming in second among women runners and eighth overall. 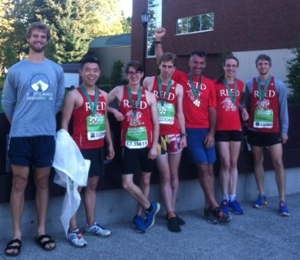 Other fleet-footed Reedies included physics major Trevor Soucy ’18 at 1:28:47, philosophy major Ki Choi ’17 at 1:29:25, and Mike Brody, dean of students, at 1:39:19, who barely edged out poly sci major Xander Harris ’16 at 1:39:51. We spotted many other Reed runners on the course, including Sebastian Pastore ’90, Megan Harrington ’03, Emily Samstag ’09, Sarah Tiffany-Appleton ’14, Adam Casey ’14, Harrison Salton ’15, Brad Eamon ’15, Nancy Fries (mom of Ian Fries ’18), public affairs impresario Stacey Kim, development deity Chris Brentlinger, and President John Kroger. What greater glory attends a man while he's alive, than what he wins with his racing feet and striving hands? Come and compete then, throw your cares to the wind! 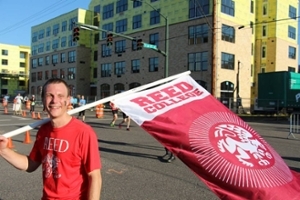 The idea of Reed making a splash at the Portland Marathon first originated with John Bergholz '83, who hatched the plot a couple of years ago in conjunction with steadfast runners Todd Hesse, Stacey Kim, Ueli Stadler, and President Kroger. 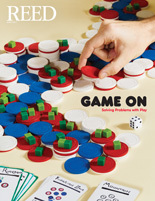 This year's event must be considered a triumph for the Reed physics department, which far outpaced the other disciplines. We hope further research will determine whether this is a coincidence or the result of some underlying phenomenon.